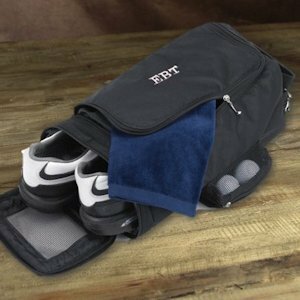 For an attractive and practical way to carry spare shoes, this personalized shoe bag is just what you need. Designed for the sports-minded individual, this bag features an end zipper for easy access and two side pockets for storing essentials. 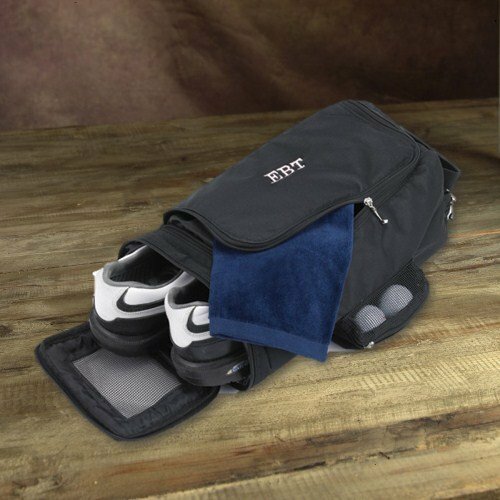 A convenient handle makes carrying easy and built-in ventilation keeps the shoes fresh. Available in solid black or black herringbone, the bag measures 15" by 6 1/2" by 5 3/4" and can be personalized with three letters.